The South Sea Scheme, Engraving, 1721. 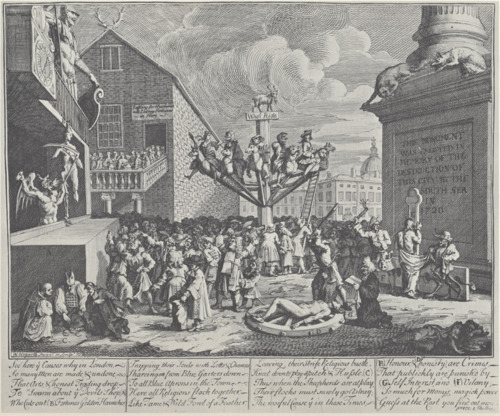 The print shows a London scene, with a statue of a giant to the left; a column to the right is erected, its base originally reads “Erected in memory of the destruction of the City by the Great Fire in 1666” but Hogarth alters the inscription to “This monument was erected in memory of the destruction of the city by the South Sea in 1720” (Stevens, 8). Hogarth does this to achieve equalizing the tragic results of the two events. St. Paul’s Cathedral is in the background. The monument represents the city’s greed juxtaposed with St. Paul’s, which represents the city’s charity (Stevens 9). In the center of the print is a large construction, which seems to represent a merry-go-round of figures representing all levels of society, indicating the ways in which the South Sea Bubble affected all classes of people. These figures include a clergyman, a prostitute, a hag, and a Scottish nobleman (Walcot 415). A goat sits atop a sign that says “Who I Ride.” In the upper left, a long line of women are entering a building with a sign that says “raffling for husbands with lottery fortunes in here. On top of the building is a set of stag antlers (Walcot 413), which is symbolic of women cuckolding or leaving husbands who have lost their money in the crash. To the left, “Fortune” hangs by her hair, blindfolded as the devil chops off parts of her body and throws them to the crowd below (Tate). She is hanging from a Balcony of the devil’s shop, aka Guild Hall (Walcot 413). To the right, the figure of “Honesty” is broken upon a wheel of self-interest (416). A man who represents villainy, whip in hand and a mask upside down between his legs, stares at a figure representing “honor” as if ready to beat him. Beneath villainy stands a monkey wearing the cloak of honor, representing mimicry (Walcot 416). A Puritan, a Jew, and a Catholic stand at bottom left, ignoring the chaos and focused on the gambling, not having learned the harsh lesson about speculation. Finally, the figure of trade, at the very front, appears to be dead. The corpse of trade is easy to overlook in the ensuing chaos. An Anglican priest stands to the right, overlooking the entire scene. The South Sea Company was a British stock company founded in 1711. The company was part of the treaty during the War of Spanish Succession, which was traded in return for the company’s assumption of debt run up by England during the war. The South Sea Company was plagues with financial speculation, corruption and credulity that caused the south sea bubble in 1720 (Sperling 5). Hogarth illustrates a scene that reflects the reality of the corruption behind the bubble. When the bubble burst because of rising stock prices due to speculation, a large portion of company investors were left broke as the company crashed. These company investors were people in all walks of society. As a fraud between the company’s directors and cabinet ministers surfaced, political scandal began to cause mass chaos. means, whether through the state lottery, stock-jobbing, or gambling, as unearned and unproductive. The consequences are evident, with emblems of honest, legitimate commerce lying abandoned amidst the now anarchic streets” (415). Walcot, like many others, finds Hogarth’s engraving to be satirizing the foolishness of all those that invested in the South Sea company. She points out that he uses a series of allegorical figures to represent the many social classes that were left broke because of their blind investments in the “unproductive” (415) stocks. There is a vast history involved behind “The South Sea Scheme” engraving by Hogarth. First of all, we must start with the reason as to why the South Sea bubble even happened. The South Sea Company was an International British trading company, which was founded in 1711 by the Lord Treasurer Robert Harley. In 1713, the War of Spanish Succession ended along with the signing of a peace treaty that declared the trading rights of the South Sea Company. Their rights included the right to supply the Spanish colonies with slaves and to send one trading ship per year. “These formalized trading rights were a disappointment to Robert Harley as they were nowhere near as extensive as he had originally expected when he originally founded the company in 1711” (Columbo) After the War of the Spanish Succession, the company was granted a monopoly in trade with Spain’s colonies in South America and the West Indies. This resulted in the south sea company assuming England’s war debt (Columbo). Shortly after, all classes of British society were engaged in the stocks speculation, which is apparent in Hogarth's engraving. Following the speculation, the South Sea Bubble popped and the stocks crashed, destroying the financial basis for all its investors. As South Sea Company and other “bubble” company share prices imploded, investors who purchased their stocks shares on credit quickly went bankrupt. Jesse Colombo explains: “Investor outrage led Parliament to open an investigation into the matter in December 1720, resulting in a report that revealed extensive fraud as well as corruption among members of the Cabinet.” Hogarth offers his own brutal image of the South Sea Bubble crisis, and satirically reflects his opinions of ignorance and corruption. Colombo, Jesse. "The South Sea Bubble." The Bubble Bubble. 18 May 2012. Web. 28 July 2014. Sperling, John G. The South Sea Company: An Historical Essay and Bibliographical Findinf List. Harvard Business School, 1999. Walcot, Clare. "Hogarth's "The South Sea Scheme" and the Topography of Speculative Finance." Oxford Art Journal 35.3 (2012): 413-32. JSTOR. Web. 28 July 2014.